Ottawa Senators captain Erik Karlsson is brandishing a different look this season. 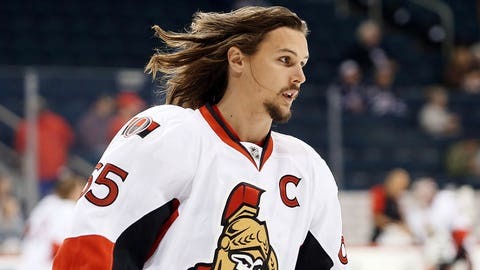 Ottawa Senators captain Erik Karlsson offered the cryptic message “R.I.P #theflow” to his Twitter followers on Wednesday. Known for his long locks, Karlsson brandished a shorter and more aerodynamic hairstyle during the team's practice. The two-time Norris Trophy winner told the Ottawa Citizen that the haircut was “overdue”, but quickly found himself on the defensive on social media. Karlsson collected 21 goals and 45 assists in 82 games last season. The 25-year-old Swede and the Senators will open the 2015-16 campaign against the Buffalo Sabres on Thursday.